WASHINGTON, DC – More than 1 million Hispanics had an asthma attack last year and 25 percent of all tuberculosis cases in the U.S. strike the Hispanic community. As a step in reaching the Hispanic community to better control lung disease, The American Lung Association has joined forces with the Hispanic Association of Colleges and Universities (HACU) by signing a Statement of Understanding (SOU) that will expand the Lung Association’s outreach into diverse communities. The SOU will generate collaboration on areas such as smoking cessation programs, asthma management projects, environmental health issues and involvement in volunteer and leadership roles. The American Lung Association’s union with HACU will provide HACU members with seamless access to information on smoking cessation programs, asthma management programs and other areas that relate to lung health. This cooperative relationship will also enhance the involvement and participation of students from Hispanic-Serving Institutions in American Lung Association programs and services (i.e. Open Airways For Schools, Teens Against Tobacco Use, and Freedom From Smoking). “HACU is dedicated to promoting college and career success for the nation’s youngest and largest ethnic population. We welcome this new partnership with the American Lung Association to also actively engage our Hispanic college students in health care education and outreach to the larger community,” said HACU President and CEO Antonio Flores. HACU represents 340 colleges and universities serving the largest concentrations of Hispanic higher education students in the United States. HACU also promotes pre-collegiate and lifelong learning opportunities for the larger communities served by its member and partner higher education institutions in the United States and abroad. The American Lung Association has been fighting lung disease for nearly 100 years. With generous support of the public and the help of volunteers, there have been many advances against lung disease. However, the work is not finished. Looking forward to their second century, the Lung Association will continue to strive to make breathing easier for everyone through programs of education, community service, advocacy, and research. The American Lung Association’s activities are supported by donations to Christmas Seals® and other voluntary contributions. For more information about the American Lung Association, visit www.lungusa.org. 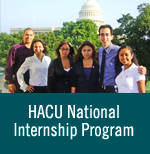 For more information about HACU, visit www.hacu.net.